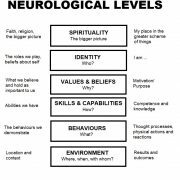 Based on the earlier work and thinking of Bertrand Russell and Gregory Bateson, Robert Dilts created the system model known as ‘Neurological Levels,’ sometimes abbreviated to Logical Levels. This is a model that can be thought of in various ways and that has various uses. It attempts to describe the different ways we experience and process that experience, and at the same time to assign a hierarchy. The model proposes that the level below will affect the level above, but the higher up the hierarchy one travels then all levels below will be affected. Environment is about the place, or places in which we live, defined by the external conditions in which behaviours take place. A person operating at this level will notice the place and the people around them. Different environments will have different meaning and significance to the individual. Some tribal markers will be recognised at this level. When we decide to improve, develop or make changes the results will often be most identifiable on this level, through the behaviours we demonstrate. Behaviour refers to the actions and reactions by an individual within a given environment. A person operating at this level will be describing what they thought (mental behaviour) and did (physical behaviour), and also what effect those behaviours had. In a therapeutic context or coaching situation it also includes what they might have done, and what effect that would have had on the outcome. Skills and Abilities is the level of capability or competence: what the individual is able to do in other words. Therefore this level might be considered the ‘how’ level. Ability drives behaviour through personal strategies, which involve skills and their development. A person operating at this level, is talking and thinking about ‘how’ to achieve something, including the skills they might need to develop to do so. This level is about the reasons behind the behaviour, including any underlying values. Beliefs and Values can either reinforce or undermine capabilities. For example, a belief that you are ‘not good at drawing’ could undermine any attempt to learn to draw well, and the motivation to do so. Identity is about ‘who’ you are, and the sense of self. Conversations on this level are often about who the individual thinks they are, and how they see themself. It will be recognised that the lower level of belief has a significant impact on this level I.e. “I believe I am a good/bad/lucky/unlucky/intelligent/stupid person” etc. It should also be noted that every individual tends to have a continuing inner narrative about who and why they are, and their place in the world. Personal self-actualisation* may also take place largely on this level, especially if the individual has no strong religious or spiritua; beliefs. 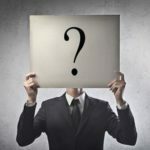 such as ‘What do I like?’, ‘What makes me tick?’, ‘What is my passion?’ A person suffering from stress and burnout often engages at this level. Spirituality is not always included in the logical levels, and might be thought of as a step beyond the others. It is about something bigger, beyond the individual, and related to being part of a bigger system, whether that be family, community or beyond. For some people this level will be described by their faith or religion. Some people call this the ‘wisdom’ level, while others exclude it altogether, or link it to identity as part of how the individual see themself. The Logical Levels model has many applications: one way to use it is as a model to help identify what promotes or hinders effectiveness. It is important to remember that what we think influences what we do/how we behave, and ultimately the results we get. *Self-actualisation – The realisation or fulfilment of one’s talents and potentialities, especially considered as a drive or need present in everyone.